D-1 type, Tlatilco, Ca. 1150 to 550 B.C. 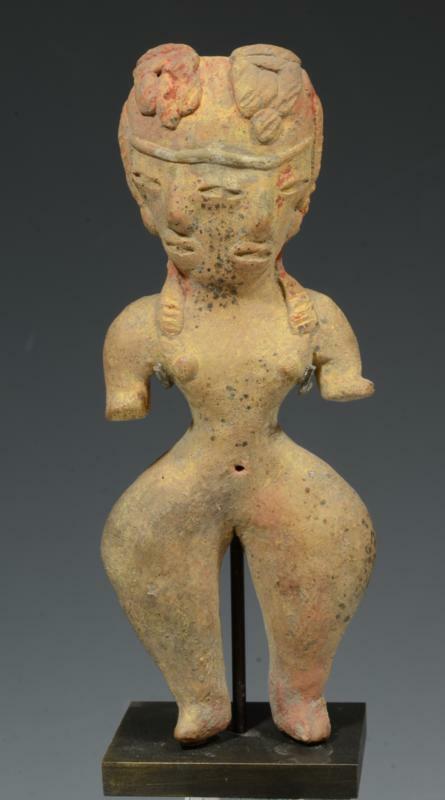 A solid pottery standing female figure depicted with wide, curved hips and a double face, sharing a center eye, Applied hair tufts with some remaining ocher and red pigment highlights. Size: 4-5/8 inches H. + mount. Scattered mineral deposits on the surface. Intact, excellent condition. Extremely rare type. Provenance: Collection of Albert J. and Monique Grant, NYC., acquired 1950s-60s, collection #H7. It is an extraordinary and sensitive portrayal of dualism, perhaps representing male/female; youth/old age; or life/death.